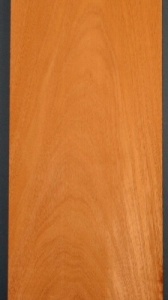 Honduras Mahogany box maker's piece 1020 x 152 x 4mm re-sawn from kiln dried planking with a sanded finish. Medium reddish brown darkening with exposure. Medium textured, strong, stable, lustrous and easily wrought. A sought after timber coveted by musical instrument makers because it is medium weight and resonance, and by antique restorers and furniture makers for the classic beauty and colour when mature.